First, Why Is It Called “Miner’s Lettuce”? 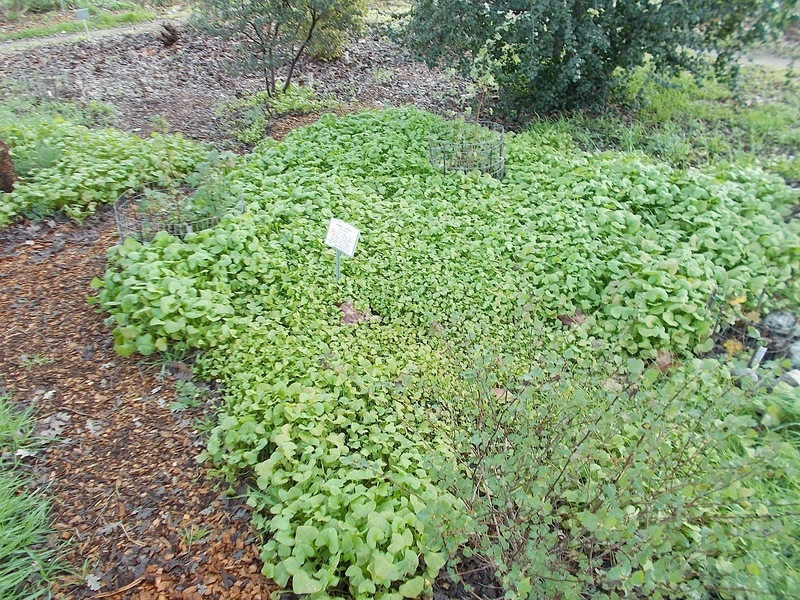 Miner’s lettuce was a traditional food of the Chumash Indians of California’s central and southern coastal regions. The leaves are soft and tender, resembling fresh spinach, and remind me of the expensive tasty Bibb or butter lettuce that we buy in our markets. It was eaten raw or cooked; a tea made of the leaves was used as a mild laxative or diuretic, or as an “invigorating Spring tonic”. Like other highly nutritious salad greens that we are encouraged to eat more of, the plant is rich in Vitamin C. During the Gold Rush era, it was an important way for the miners in California to avoid developing scurvy, a serious disease caused by a deficiency of that vitamin. Hence the name! Second, What Is Curious About the Foliage? As the leaves continue to mature, the two lobes near the stem of the heart-shaped leaves grow closer together and eventually fuse to form a circle, and a flower bud forms in the center of the leaf. Hence the species name, “perfoliata”. Once the miner’s lettuce gets well-established, it easily shades out most other competi- tors, including non-native grasses. 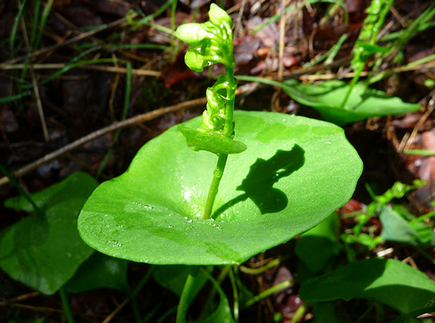 After the seeds form and fall to the ground, the miner’s lettuce disappears until the next spring comes around. 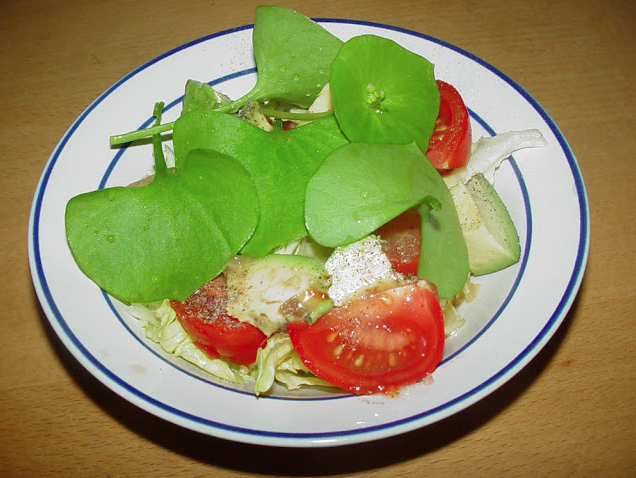 Miner’s Lettuce on Your Dinner Table Archibald Menzies (1754-1842) was a Scottish surgeon, botanist and naturalist. He served as a surgeon on a number of British exploratory missions, which included to North America. During these trips, he both tended to the health of the crew, who needed a well-rounded diet during long ocean voyages to prevent scurvy, and collected new and unfamiliar plants. On a trip to the west coast of North America, he became familiar with greens that the Native Americans ate as salads, such as clovers, sour docks, watercress … and miner’s lettuce. Back in England in 1794, he brought seeds of miner’s lettuce to the Kew Royal Botanic Garden in London, where it flourished. Eventually some even showed up in the Botanical Gardens of Paris. 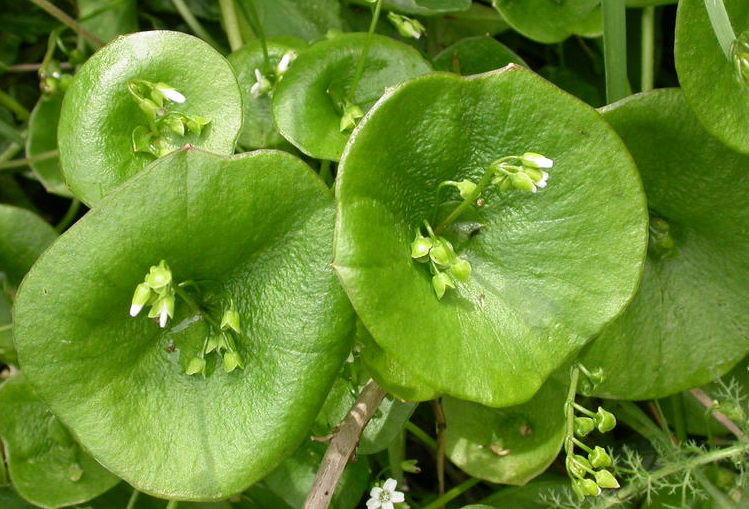 The British regarded miner’s lettuce an important source of vitamin C and subsequently planted it in Cuba and Australia. In Europe it is known as winter purslane. Bert Wilson of Las Pilitas Nursery says that it “kept the British in greens” during World War II. You can use it as you would any other salad greens – in salads, sandwiches, tacos and tostadas, or steamed like spinach. Reportedly a few chopped leaves help thicken a soup or stew. 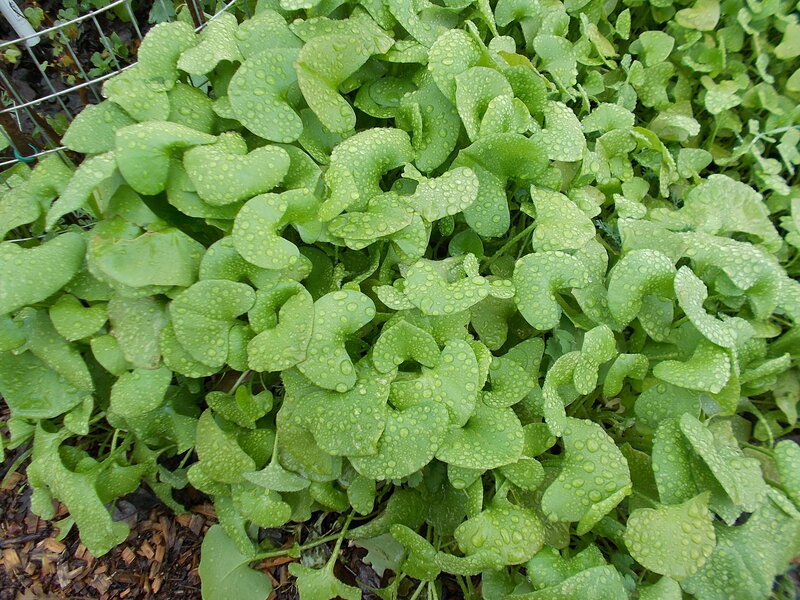 Miner’s Lettuce Is Easy to Grow In fact, it is so easy to grow that it can rapidly take over a garden without any help. Of course, it wilts and disappears as soon as the weather warms, and you won’t see it again until next winter. Some appeared in my yard about two years ago. Now it is all over the yard, front to back. I was told that ants will pick up the seeds and carry them about. Why? I don’t know. 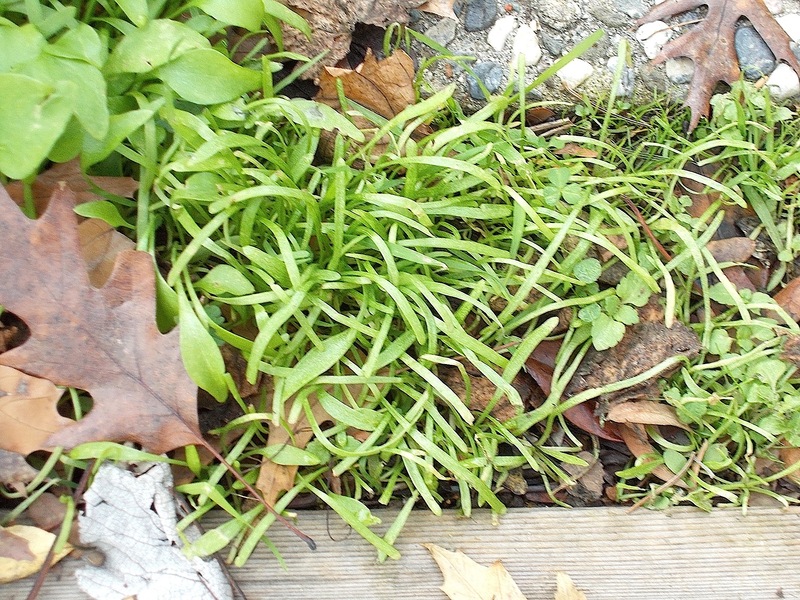 But this might explain why some miner’s lettuce seeds that I spread at the Granada Native Garden last year are now sprouting in a completely different location. 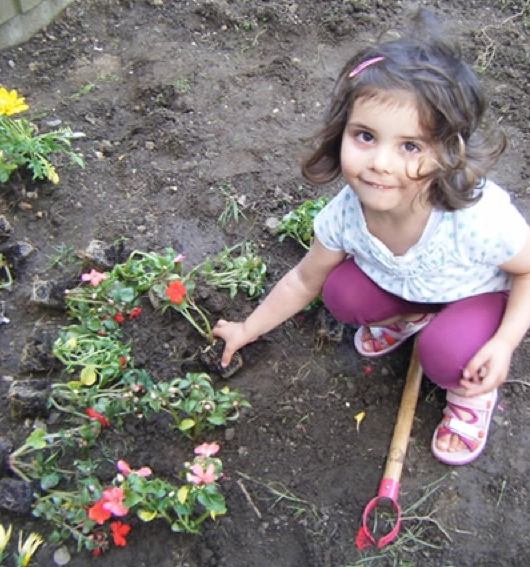 “Easy” is a good word to keep in mind when stimulating your youngster to try something new and different, like planting a garden and trying new foods. 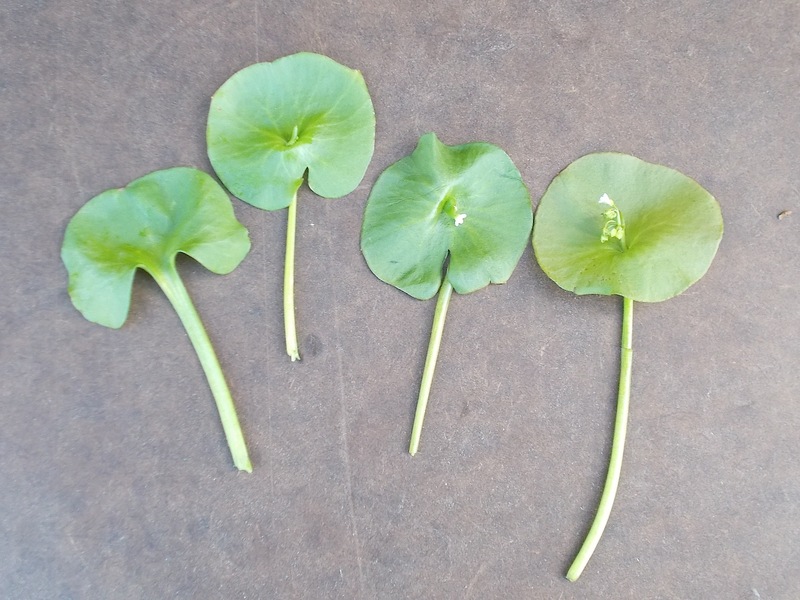 Miner’s lettuce germinates quickly (given favorable conditions), has that interesting leaf sequence, and it can be eaten! Some Nutritional Information For anyone who is concerned about eating any food they don’t find at their neighborhood supermarket, here is the lowdown on miner’s lettuce as a food for humans. The only warning I have found about eating miner’s lettuce is that it contains oxalates, which are responsible for forming kidney stones. To put this into perspective, miner’s lettuce is regarded as low in oxalates. The Children’s Medical Center of Dayton, Ohio reports that common foods that are highest in oxalates include spinach, rhubarb, beets, nuts, chocolate, wheat bran, strawberries, peanuts, almonds, and tea. These are not foods that we normally discourage people from eating, but probably should be avoided by people who are prone to develop kidney stones. On the other hand, the American Dietetic Association reports that 100 grams (3.5 ounces) of miner’s lettuce contains 33% of the adult recommended dietary allowance (U.S. RDA) for vitamin C, 22% of the vitamin A allowance, and 10% of the iron. Nevertheless, any edible native food that is harvested for consumption should be washed, just like any vegetable or fruit we obtain at the market. Quote du Jour “I like to think that the people who do the graffiti at the Granada Native Garden have generally learned that there are nice people working at the Garden, and they should not graffiti it. But every so often someone new does some damage, but in general the community likes all the things that the staff does at the garden.” – Dave Lunn, one of our volunteers at the GNG. I got seeds from Larner Seed Co., Bolinas. But they have a minimum order of … about $25. Thanks for this article. Didn’t know that the cotyledon leaves become spatulate leaves. Excellent photos. I love miners lettuce in salads. The stems can also be eaten. Very crunchy, a bit fibrous so I chop them up into 1″ chunks first. Low maintenance plant. After setting seed, it dries up completely. No dry dead stalks to clean up. Looks best in winter months. Starts drooping by April. Nice post! One of my favorite work place snacks this time of year. I taught two classes of third graders about this plant last week on field trips. They were required to check every leaf with me before eating but they gobbled that stuff down to the amazement of parents who can’t get them to touch spinach at home!